People in many professions use 3M earplugs to prevent injuries to their ears and their hearing. Unfortunately, some of these earplugs may be defective. The 3M company has agreed to pay more than $9 million to settle claims that it supplied the United States Defense Logistics Agency with defective combat arms earplugs. Allegedly, 3M and Aearo Technologies, Inc. knew that their CAEv2 earplugs were too short to be inserted in certain users' ears and that the defective earplugs might loosen within the ear and not perform to prevent injuries. This problem was not disclosed and placed military service members at risk of suffering ear damage or hearing loss. If your ears were injured or you lost your hearing due to the failure of 3M earplugs to work as they were claimed to work, you may have a basis to sue for compensation. At Moll Law Group, our 3M earplug injury lawyers represent clients all over the country. 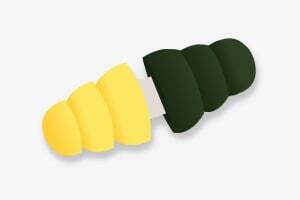 The Combat Arms Earplugs, Version 2 (CAEv2) were used exclusively by service members who worked in all branches of the Armed Forces in Iraq and Afghanistan. The earplugs were developed by Aearo Technologies and sold to 3M. 3M built on the original design to develop an earplug that members of the military wore from 2003 to 2015. Veterans and service members who wore 3M Combat Arms Earplugs may be able to sue for damages associated with hearing loss or tinnitus that arose from the defective earplugs. Aearo Technologies first developed the Combat Arms Earplugs, Version 2 before selling the technology to 3M. 3M expanded on that design to create an earplug that functioned in two different ways. However, the end that is put into the ear canal was not long enough to completely block sound in all ears, which meant that a user could be exposed to sounds of gunfire, aircraft, and explosions. Often, the user would not realize that their ear canals were exposed to the loud, damaging sounds. The results could include tinnitus and hearing loss, the two conditions that the earplugs were worn in order to prevent. It is believed that 3M was aware of the defect in 2000, long before the earplugs were in wide use. Product liability lawsuits brought by 3M earplug injury attorneys must be based on actionable defects. There are three types of possibly actionable defects: design defects, manufacturing defects, and marketing defects. Design defects are flaws in the design process. Manufacturing defects are flaws in the manufacturing process. Marketing defects are flaws in how information about the product is provided; often, a lawsuit alleging marketing defects is alleging a failure to warn. In the case of the 3M earplugs, it is believed that there were design defects. Moreover, it may be appropriate to allege a failure to warn. If a 3M earplug injury lawyer is able to establish liability, a victim may be able to recover compensatory damages for the hearing loss or tinnitus. These are damages composed of both economic and noneconomic losses, and they are awarded in order to put you back in the place in which you were. Sometimes it may be possible to recover punitive damages as well in situations in which a company knew of the high degree of risk of injury to users of a product yet acted in conscious disregard of the risk. Different states have codified different standards for punitive damages. In an Illinois product liability action, for example, it must be shown that a manufacturer engaged in willful and wanton conduct, or acted with utter indifference to the safety of others. If your hearing or ears were harmed, you may have a basis to sue for compensation by bringing a product liability lawsuit. Moll Law Group is a Chicago-based product liability firm that is familiar with 3M earplugs and the problems with them. Contact us at 312.462.1700 or via our online form.